← Is that a Foolishness in your pocket or- oh, never mind, I see it. It’s a Foolishness. All of us know someone that has issues. It’s an Bell PR gimmick, but it’s also an easy way to help. 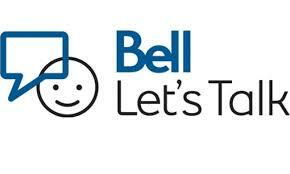 UPDATE: Bell will also donate for any tweets with the #BellLetsTalk hashtag. All across Canada we have been seeing commercials with just this logo since right after Christmas. I’m pretty proud of this campaign and I’m pretty proud of the company promoting it’s label. 1. Because it’s being promoted by one of our oldest and dearest company’s of my country Canada. And that company is Bell Canada. And that is mental health disorders, sadly this is the disease that you don’t always physically see and is often hidden by us with this disease because we are ashamed and sadly because that is what society has taught us is the way to deal with it. Funny, Just got off the phone with ATT USA and finally got them to make our cell phone bill less like paying blackmail. If you get the right person, they CAN help. AT&T in the US is an entirely different animal. Probably. But they can be reasoned with … something that one cannot say of many other companies. Just be glad you don’t have to deal with Google’s corporate help desk. I’m tweeting today for #gunsense and #YesOn594 though. #BellLetsTalk may have to wait! Wow! And I thought I was plugged into social media! Hi Kylie, I agree with you as I have lived on both sides of the border and sadly yes Canada is more sincere and they are held more accountable for where funds raised go too. Thank you for reblogging Guapolo your the bestest!!! I like this project very much because kids sometimes just need someone to talk to. I was one of those very lonely teens & I think it might have helped me. There are way too many suicides now to not support these kinds of support systems! And it’s so easy to give some support too. Amazing! Thanks for passing this along Guap. It’s a damned shame that AT$T customer support here in the US is a Byzantine nightmare of holding, dropped calls, let me get you my supermonkey please wait, and billing mistakes which subtract at least 40 minutes of my life from every month. No wonder they have no time to help heal the stress they themselves contribute to. One more reason to emigrate. Good message and thank you again for posting this. Every little bit DOES make a difference, even if just one person can find help. I’ve been tweeting that hashtag all over the joint, and will keep pushing it when I get back online. Thank you for passing this on, Guap. As you said, we all have or know someone who has issues. That sounds like fun actually. Great cause, Guapo! One close to all of us. It’s surprising how many this affects once you start asking around. I’ve had my ups and downs with AT&T over the years – actually, I’ve had that service since I have a phone! Yes, I’m loyal. And it pays. There is such a thing as “customer retention” and I have been the beneficiary of it. The customer service reps have usually given me the right info, and I’ve received great deals. You have to be a knowledgeable consumer. Honestly, all of my Support ire is aimed at Google right now, for the hideous gmail we use at work. Since all other vendors are better than them, I’m much happier to deal with them. And this is a very nice thing Canada Bell is doing. Brilliant project from that young cyclist whose name I missed. Canada Bell are doing a fine job too. It is so important to talk about mental illness and to take away the stigma. A campaign like that would be good here too. I agree wholeheartedly. It’s still very hard to admit to being depressed or feeling suicidal. Sarah Hughes is not such a young cyclist – she is actually quite old for an athlete. She was a speed skating star for a number of years in the Olympics & then competed in both speed skating in the Winter Olympics & cycling in the Summer Olympics at the same time. I believe she has stopped the speed skating now & just focuses on cycling. She is a wonderful athlete & has been associated with this project for a number of years as their spokesperson! Doh I can’t let it be Sarah Hughes when her name is Clara! Clara Hughes is my hero! She is the only athlete to have won multiple medals in both the Winter and Summer Olympics! She is just an amazing individual and she always keeps trying her best, and helping others to do their best! Go Clara! Oh, I am so sorry I called Clara by the name of Sarah! I can’t even blame it on a typo, but rather on a sound error in my head! Love Clara Hughes! Sorry Clara! What a phenomenal campaign. While I think the public at large has a greater awareness of mental illness, many still don’t understand it. These videos give exactly the kind of examples people need to see to comprehend the nature of the daily challenges mental illness presents. I hope people watch them and get a better understanding.